As spring approaches, so do the wonderfully simplistic looks of Vetements. Sophisticated attire blending itself with bare bones minimalism, the expected looks of the luxury company continue to impress. Take notice of the sharp contrasts between black and white, filling a more beautiful spectrum amongst its high-end peers. Style Advice: It’s far easier to stay classy than one may think. The dazzling looks of Vetements Spring/Summer 2019 runway show can be boiled down to its base elements, and the subtlety of its design can be easily recreated for any man’s wardrobe. Express’ Extra Slim Performance Dress Shirt ($70.00) is a fantastic starting point, helping to set the scene and bring in an element of light. To keep it simple, move on to your pants next. Zara’s Shiny Tuxedo Pants ($90.00) are the perfect compliment to your slim white shirt, and the company also offers a Leather Dress Belt ($40.00) with a contrasting polished buckle to really make your outfit pop. Finally, you’ll want to find a pair of shoes that closely resemble the distinct, sharp and dark Vetements style. 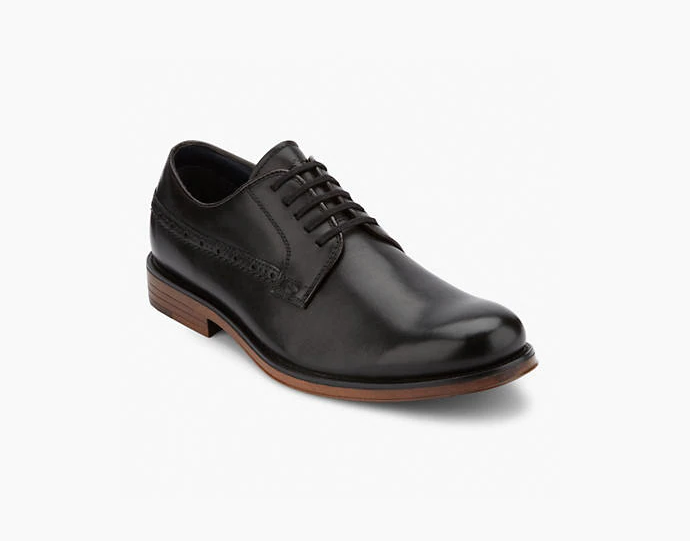 Try the Dockers Albury Oxford Shoes ($90) to round up your outfit in an excellent way, playing off the shadowed tones of your pants and contrasting the bright white of your shirt. Must Have: The word “art” gets thrown around a lot in the fashion world, but this may be your chance to really be a walking masterpiece. Commes Des Garcon’s designer Rei Kawakubo recently paid a tribute to Jean-Michel Basquiat, a fellow artist and early model of her spring/summer '87 show, by immortalizing some of his work onto dress shirts and tees. Although The CDG SHIRT collection has eight pieces in total, the most notable garment may be the Basquiat T-Shirt ($150) for its superb simplicity. A versatile tee, this top could be worn with the most basic blue jeans or most high end dress pants and still look great as the timelessness of a white shirt blends itself well into any outfit. Unless you’re planning on buying an original Basquiat painting (which have sold for over $110M!) this may be the best opportunity for not only looking fantastic, but also being able to represent a wonderful artist who has been engraved into the high-end runway culture. Industry Update: From “Black Panther” star to full on renaissance man, Michael B. Jordan has agreed to become the face of Coach’s menswear. Featuring in the brand’s advertising campaigns like accessories, fragrances and clothing next spring, Coach has also stated that Jordan will be involved in “special design projects” with Stuart Vevers, creative director of the luxury fashion company. Jordan will also reportedly participate in the The Coach Foundation, a philanthropic sector of the Coach brand focuses on many issues such as children’s education, women’s health and public parks. “With any creative endeavor, it’s all about finding the right fit,” Jordan said in an Instagram post announcing his involvement. “…excited to work with [Stuart Vevers] and the entire Coach fam. Good things on the way.” Excitement flows both ways, as Vevers mentioned in a similar statement that, "Michael is cool and authentic, and he really embodies the Coach guy.” Already familiar with the fashion world by attending the 2018 Met Gala in a pinstripe Louis Vuitton suit designed by Virgil Abloh, Jordan and Coach seem to be a match made in heaven.